If we define the Race To a Billion to be bounded by a time limit of 10 years, then Windows does not qualify and Android is actually second. The race is shown in the following graphs (the one on the left is logarithmic scaled, the one to the right includes only a few contenders for illustrative reasons). Without qualification, Android has been a viral success story. It reached one billion activations in about five years, almost half the time it took FaceBook and far faster than Windows. One way to read the two graphs is: Between March and August, of the 250 million Android devices activated, 4 million were to new Android consumers in the US. 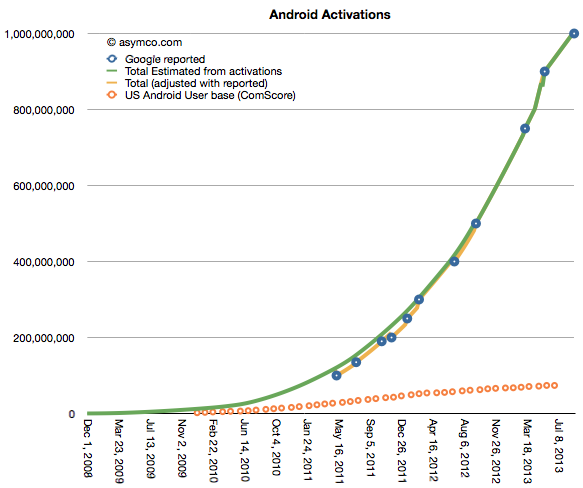 In other words, In the last six months, 1.6% of Android activations went toward new usage in the US. The equivalent figure for iOS is about 6%. Note that these are new users, not included are upgrades. It’s likely that more of the US buying goes toward upgrades because iOS has been in use longer. 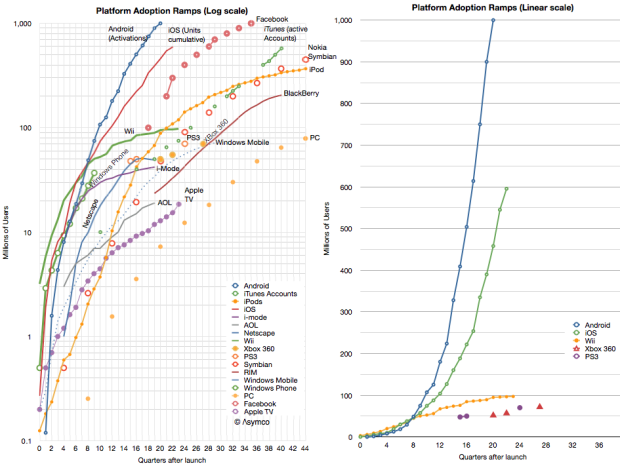 So whereas Android is growing very rapidly, there is a question of reliability of that audience. Engagement is one thing, but in the market which shows highest penetration (and deepest distribution of an alternative) Android is peaking. › Next Post The Critical Path #95: Catharsis or Anticlimax?